The Federal troops were posted along the Ohio from Bird's Point to Louisville. The Confederates from Columbus, by Forts Henry and Donelson, to Bowling Green and Munfordsville. The Confederates were commanded by Albert Sydney Johnston. The Federals were under two commands, Halleck at Cairo and Buell at Louisville. The idea of piercing the Confederate defensive line by the Cumberland and Tennessee Rivers seems to belong to Buell. Grant captured Fort Henry on the 6th and Fort Donelson on the 16th, assisted by the fleet under Commodore Foote. The effect was remarkable. Polk evacuated Columbus and Johnston fell back through Nashville and finally to Corinth through northern Alabama. Thus all of Kentucky and most of Tennessee fell into the hands of the Federals. Still more decisive results might have followed if Grant had moved to the east, joined with Buell, and attacked Johnston, or if he had moved to the west against Polk, but the divided commands were probably largely responsible. The Confederate formed a new line of defense on the Memphis and Charleston Railroad without molestation by Grant. Halleck then decided to break the Confederate line once more, this time in the vicinity of Florence. Grant was ordered to send General Sherman up the river in boats and C. E Smith to Savannah. Meanwhile Buell had been transferred to Halleck's command. Sherman found the country flooded by the spring rains and stopped at Pittsburg Landing which was the only good landing place above water. It was a shipping point for Corinth, 22 miles to the southwest, where large forces of Confederates were known to be concentrating. Halleck ordered Buell to Savannah from Nashville. 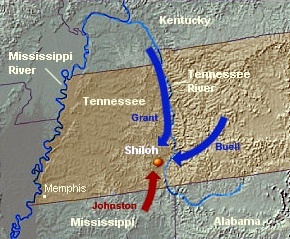 Two divisions were camped at Shiloh (Pittsburg Landing). Buell's advanced troops reached Duck River. Beauregard came as adviser and assistant to Johnston. Bragg's corps joined from Mobile. Van Dorn was ordered up from Arkansas. Grant remained at Savannah with headquarters. He had one division under Lewis Wallace at Crumps Landing and four divisions under Sherman, W. H. L. Wallace, Prentiss, Hurlbut and McClernand on the Shiloh plateau, between Lick Creek and Owl Creek, at the west of the Landing. On the other hand, the Confederate Army was scattered from Burnsville to Bethel [Tennessee]. The Confederate commander learned of the advance of Buell and that he would be at Savannah in a few days, so he planned to attack Grant before he could be reinforced. At 1 A.M. the order was issued for the concentration of the army at Mickey's, 14 miles from Corinth and 8 miles from the Landing, on the next day, so as to attack on the morning of the 5th. As the order was very long, some 1500 words, it could not be issued before the movement began, so it was explained verbally to the 3 corps commanders who were in Corinth. The army was to concentrate on Mickey's. Two corps less 1 division were to march by the Bark Road with an interval of a half hour of time, but a third corps was to be interpolated between the two corps. After reaching Mickey's the command would be corked up, with only one outlet in the direction of the enemy. The Confederate concentration was delayed. The 14 miles between Corinth and Mickey's were not covered. Hardee's corps left Corinth at 3 P.M., April 3 by Ridge Road; at 7:30 A.M., April 4 his corps had passed through Mickey's. Bragg's corps did not get through Mickey's till 4:30 P.M. on the afternoon of April 5. Polk's corps was under arms from 3 A.M. till 2 P.M. on the 5th April on the Ridge Road waiting for Bragg's column to pass. Breckinridge marched from Burnsville to the loop in 2 days with unobstructed roads. As a result the time for attack was postponed. During the day the army was formed in 3 lines about 1 1/2 miles from the Federal camps, on a front of 2000 yards. At noon the leading division [Nelson's] of Buell's army reached Savannah. The Federal army was scattered about in isolated camps. A superior enemy was known to be twenty-two miles away. There was no defensive line, no point of assembly, no proper outpost, no one to give orders in the absence of the regular commander, whose headquarters were nine miles away. The greenest troops were in the most exposed position. Sherman had three brigades on the right and one on the left, with an interval of several miles. The field of battle was triangular in shape, consisting of between three and four thousand acres of plateau, about 80 feet above the river. The surface was broken by many deep ravines and on the south, running east and west, was a heavily wooded ridge which rose one hundred and fifty feet above the plateau. The ground was mostly covered with forest, and sometimes very thick underbrush. Not more than one-sixth was cultivated. A field of fire of six hundred yards was hard to find. Two creeks which rise near Monterey and flow into the Tennessee, one above [Owl Creek] the other below [Lick Creek] the Landing, enclose the field of battle. At the time of which we speak they could only be crossed at a few places where bridges were maintained. In one respect, therefore, the position was excellent, as it had its flanks resting on impassible obstacles. The distance from one flank to the other was about five miles in an air line. These creeks flowed through wide, low, marshy bottoms. Within the limits of the field were several smaller creeks. They were: Shiloh Branch, Tilghman Branch and Dill Branch. From the Landing to Corinth the road runs southwest between the two creeks. It divides about a mile from the Landing and the two come together again about five miles out. Cutting these almost at right angles are the river road, from Hamburg above to Crump's Landing below on the river, and the Purdy-Hamburg road. Along the high ridge at the south the Bark road runs east and west. Near the junction of the Corinth and the Purdy roads was the Shiloh meeting house, which gave one of the names to the battle. The maps used by both sides were so inaccurate that it is hard to understand how military movements could have been based on them. On the Federal side the commander of a division six miles away was not able to reinforce the army because he lost the road. Likewise the road from Grant's Headquarters to the army was unknown, which was the principal reason why another division did not reach the field till dark. The war had been going on for a year. Each side employed its best officers who were aided by all the resources of the country and the support of the people. Of the two the Confederate army was the best organized and the better led. In the most important positions there were thirteen graduates of the military academy, having from forty-four to fourteen years' service, of high reputation and experience in war. Among regimental commanders and staff officers were seventeen men who had served in the regular army. In the federal army Grant and Sherman alone among the higher commanders had served in the regular army, and both had been out of the service for some years. Sherman had not served in the Mexican War. There were not more than seven officers in all who had been in the regular army. Three divisions of Grant's army had fought at Forts Donelson and Henry and a few regiments were at Belmont. Among the others the average amount of service was about six months. Grant had about 40,000 men including 3000 cavalry and 123 guns. The Confederate army was slightly larger. The Confederate army was commanded by a general with another general as second in command, or chief of staff. It was organized into four [three] corps and a reserve corps, commanded by major-generals. Two corps were divided into two divisions each, commanded by major-generals and brigadiers. The other corps were not organized into divisions. These were sixteen brigades, all of which except five were commanded by brigadiers; and five were commanded by colonels. The staffs were fairly complete. The Federal army was commanded by a major-general with a colonel as chief of staff. There were no army corps, but instead there were six divisions commanded by two major generals and four brigadiers. There were eighteen brigades, all but two of which were commanded by colonels. The staffs, as a rule, were not complete. Only one staff had a quartermaster and a commissary. The cavalry and artillery of both armies were scattered about among divisions and brigades. There was no chief of artillery and the chief of cavalry was at Halleck's headquarters far to the rear. The Confederate army approached unobserved by the Federals and bivouacked in several lines of battle on a front of about 2000 yards, between one and two miles in front of the Federal camps. They stood at about 22 men to a yard of front. A single battalion constituted the main outpost of the Confederate army. It was about four hundred yards in advance. The Federals had done some reconnaissance. General Sherman had shown his customary activity and had, a few days before [April 3], sent a force as far as Monterey. Two days before the battle his scouting party had encountered troops of the three arms but he did not give it serious consideration. With such a force, wild and alarming rumors are likely to be prevalent and the General thought it necessary to tone up his command by belittling the question of danger. It rained on the day before the battle, and General Sherman's cavalry regiment, which he would have sent out that day, happened to be moving its camp. The balance of the 3000 cavalry seems to have been doing nothing. Not a patrol left the camp, although the enemy had been very active for a week. It was scattered about in the manner habitual at that day. Prentiss sent out a patrol of infantry under a colonel on the day before the battle, but it returned after traveling as reported, five miles, without discovering the enemy which was close in front. Many stories are told of Confederate cavalry all day watching the camps from various points in the outskirts of the camp. It is remarkable that there was not a deserter or traitor in that army to betray its position. For the Federal army the claim has been made that one company from each regiment was placed one and a half miles out on picket and that vedettes, were still further one mile, but the Confederate line of battle was within these distances. In Prentiss' Division there was an old soldier by the name of Major Powell who went out on the Corinth road with three compames, before daylight of the 6th. He ran into Major Hardcastle who was posted as outpost for the Confederate army, 400 yards in its front. This started the battle. Powell was killed and his story has never been told. I have always had an idea that he himself conceived the idea which he executed and that he should be considered as one of the heroes of Shiloh. This engagement of the outposts took place about 5 A.M. and lasted till about 6:30, when Powell was driven back by the advancing Confederate army. At 7:30 A.M. Prentiss had supported his scouting party and by 7:30 his entire force was formed in advance of his camps. Sherman's brigades formed at their camps. Johnston had given the order to attack at daybreak. The first line consisted of Hardee's corps and Gladden's brigade of Wither's division of Bragg's corps. There were probably ten or twelve thousand men in this line. Cleburne moved towards Sherman's camp, Wood and Shaver attacked Prentiss at about 9:30 A.M.
At 8:00 A.M. Gladden and Chalmers got in position in front of Prentiss, Cleburne in front of Sherman. At 9:30 A.M. Prentiss was attacked and driven through his camps. Cleburne attacked and his division [brigade] became dispersed. Anderson and Johnston [Johnson] came up in his rear and renewed the attack. The second line under Bragg at 800 yards, somewhat stronger than the first was thus getting engaged. They took their places in the front line, but as the second was used to extend the line to the right and left and to fill gaps in the center, the integrity of the commands of Bragg and Hardee was destroyed at once. The same soon happened with divisions and went down to smaller commands. The higher generals then took command of any troops in sight and by common consent assigned themselves to certain parts of the field. Sherman's advanced troops had been driven back at the same time as Prentiss. McClernand's brigades had formed but had not advanced. At 9:00 A.M. we simply show the arrival of Russell's brigade, without other changes. At 10:30 A.M. Sherman was being driven to the rear, along with McClernand's 3d brigade. Prentiss rallied about 500 men on a sunken road in rear of the Duncan field, wasjoined by a regiment from the Landing and by Tuttle's brigade of W. H. L. Wallace's division. Hurlbut had brought up two brigades and formed on Prentiss' left. Far on the left, Stuart was being driven from his camps. In rear of Sherman, McClernand had formed his remaining brigades; a brigade of Hurlbut's had taken position in support. Hurlbut's and Wallace's remaining troops were moving to the front. It was five hours since the firing began. The cannonade brought Grant from Savannah, nine miles away, but the troops in rear had not gotten up. Prentiss had been driven a mile and had practically lost his division. Sherman's division was about to go to pieces. On the Confederate side Chalmers and Jackson, after the capture of Prentiss' camp, were moved to the extreme right by Johnston's order. Statham and Bowen, with the last reserves, were coming up to fill the gap. Gibson was coming up to give his four separate attacks on the Hornet's Nest. Stevens [Stephens] and Stewart had attacked in the center and Pond far on the left had made his advance. Trabue was alone in rear of the center and left. At 11:00 A.M. the Confederate reserves were all engaged. The line of battle was four miles long, from Lick Creek to the Purdy bridge. Both flanks of the Federals were turned and the Confederates were hammering at the center, throwing brigade after brigade and regiment after regiment in unsupported, isolated attacks. At 12:00 o'clock the flanks of the Federal army were in full retreat, but the Confederates were making no impression on the center. At 4:00 P.M. the Federal right was bent far to the rear. The Confederate commander in chief, while personally directing Bowen's brigade, was killed, Sherman's entire division had disappeared. McClernand opposed a feeble resistance to a small force of Confederates but his line dissolved and broke to the rear. The line did not have the continuity shown on the map. Thousands of stragglers were wandering about. Various commanders were holding small fractions of their troops at the front, and the Confederates were closing around the remains of Prentiss', Hurtbut's and Wallace's forces, which had remained together. At 5:00 P.M. Hurlbut had been driven off. Prentiss was surrounded. Wallace was killed. About 2000 were captured. The line of battle, which at 1:00 o'clock extended four miles, is now represented by a small circle around the Hornet's Nest; Grant's fighting force is shown by the 2000 prisoners taken there. The two regiments furthest to the right and left of the attack, here joined and each captured the remnant of a regiment. Both sides were exhausted and probably little more could be done on either side. At 6:00 P.M. Meanwhile from the Landing back to the river road a desperate effort was being made to rally a sufficient force to oppose another advance of the Confederates. A number of heavy guns were placed in position and a fragment of about 5000 [actually 18,000-20,000] men was put in line. It made a formidable line, and would have made a strong defense. General Bragg, who, upon the death of Johnston, seems to have been the leading element of the Southern side, now made strenuous efforts to organize another attack. A half dozen remnants of brigades were gotten up, in which I wish to call attention to those of Chalmers and Jackson of Withers's division, which had made many attacks on that day, still ready for another. If you consider how some divisions were broken to pieces by one attack you will appreciate this. A feeble attack was made and orders were received from Beauregard which had been sent several hours earlier to retire for the night. Each subordinate commander acted as if he were fighting the battle on his own account. All rushed to the front as if afraid the battle would end before they had a chance to take a part. The Confederate formation shows the mistake of using extended lines instead of deep formations for attack. The long lines moving forward spread out to the right and left. Gaps in the forward line were filled by portions of the lines coming up from the rear. Corps, divisions and brigades were soon mixed in hopeless confusion. Attacks were made and lost before supporting troops came up. No one knew from whom to take orders. One regiment received orders from three different corps commanders within a short time. As a result many aimless and conflicting orders were issued which unnecessarily exhausted and discouraged the troops. The highest commanders, including the adjutant general, went into the fight and devoted themselves to urging the troops forward without any plan or system. By 11 A.M., there was not a reserve on the field. Instead of feeding the fight with their own troops the corps commanders finally sought various parts of the field and took command without regard to the order of the battle. Bragg may be found at the center, at the right and then at the left. The commander-in-chief was killed at the front doing the work of a brigadier. Beauregard remained near Shiloh Church, without a reserve, and unable to exercise any influence on the battle. The front of attack, which was at first less than 2000 yards in length, in three hours extended from the Tennessee River on the east to Owl Creek on the west, nearly four miles. Bragg's corps was right, left and center, at the same time. The attack was turning both flanks and breaking the center, all at once. The Federals, instead of being driven down the river as Johnston's intention was, were driven to the Landing where their gunboats and supplies were. Prentiss and Sherman occupied the most advanced camps. The former held on for a short time though not attacked by a very superior force; the latter held on till 10 A.M. and repulsed numerous attacks. But Prentiss rallied a few hundred men and halted on a sunken road where they defeated many attacks and probably contributed greatly to saving the army; while Sherman's troops after the stand in the camps did little more on that day. One division was camped about a mile from Shiloh Church and two divisions were near the Landing and at 7:30 A.M. they had information of the danger at the front. Prentiss was driven a mile before he was supported. Sherman, after holding his camps for two hours and more, was driven out of them before he received support, except by the regiments of McClernand's Division which were in the first line themselves. These things could be explained by the absence of a commander-in-chief, or of some one to give orders for him, but General Grant says that he arrived on the field about 8 A.M. while Rawlins and McPherson were there before him. At the close of the first day's battle both sides had fought to a standstill. The victorious troops had been demoralized by reckless attacks which were never supported and thousands of them immediately gave up the battle to pillage the camps. At 5 P.M. Grant probably had not more than 5000 in line ready to resist a further advance and they were badly shaken up as was seen by the action of McClernand's troops breaking to the rear after defeating Pond's weak attack. The balance of the fine army were killed, wounded, prisoners, but mostly stragglers. The same was true of the Confederate army, which had no greater force in line at the close of the day. The depletion of the commands on both sides was enormous. Regiments were reduced to squads [companies], and brigades to battalions [regiments] in many cases, while a number of large commands practically disappeared from the field. As a result of the confusion, looseness of tactical bonds, and unfamiliarity with military service, it seemed that mutual distrust of everybody prevailed. Even while performing the most gallant work a cry of retreat was often raised and sufficient to start the troops to the rear. No man knew who gave the order, each man blamed his neighbor. The report was easily started and quickly believed that the troops on both flanks had retired and that the enemy was getting in rear. The reports quite uniformly state that the author did not retreat until forced to do so by the withdrawal of troops on the right and left. The reports of the officers on the right and left also make the identical remark, and so on. This lack of confidence is peculiar to raw troops. Later in the war these things never occurred. The best divisions in 1864 would not move an inch to the rear without orders. Among Confederate commanders, General Jones M. Withers seems to have held a greater proportion of his command in hand than any other and fought six actions. General Sherman on the other side was able to pursue the enemy on the day after the battle with a brigade that was broken to pieces on the first day. Generals Prentiss and W. H. L. Wallace held the Hornets' Nest until surrounded by the effective strength of the entire Confederate army except a part of Pond's brigade and lost only 2200 prisoners. The character of the action is well shown here by the fact that the right and left of the Confederate army each captured prisoners at the Hornets' Nest. It is probable that the heaviest losses occurred in retreat. Tuttle's brigade which held its position in the Hornets' Nest for five hours against repeated assaults and the fire of sixty guns lost not so many as a number of single regiments which yielded their positions. The loss of each army was in the neighborhood of 10,000 men, or from 20 to 25 per cent of the men engaged which made it one of the bloodiest battles. About half of the regimental and higher commanders were killed, wounded and missing. The Sixth Mississippi lost 300 in killed and wounded out of 425. Cleburne's brigade lost in killed and wounded 1000 out of 2700 and other losses reduced it to 800 men in the evening. The first day at Shiloh shows better than any other in our history the kind of work performed by a new army before it has had experience and discipline. As the result of a year of preparation it is a most instructive lesson.